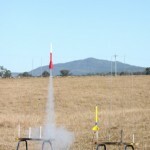 The photos of the 19th June 2011 launch were taken by Leigh Metzroth and Ben Genn. What an absolutely cracker of the day weather wise,clear skies, no wind and around +20 degrees. It was chilly in the morning though ! Congrat's to John also for his successful L1 attempt, absolutely perfect flight too and recovery. Something I forgot to do is to congratulate Len on his successful L2 in Williams, better late than never !! 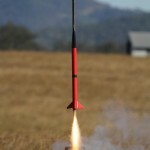 We had a what you could call a "funny" day in rocketry as we saw number of "interesting" flights indeed. It was just nice to be there among all the good people, see the rockets being launched and enjoy a perfect day ! Some QRS Members were fortunate enough to travel to WA recently for the annual Williams Wildfire Westernationals, hosted by Tripoli WA. This was an amazing weekend with many great launches. A full report will be available soon, however just for a teaser, here is a photo of the N2000W drag race. 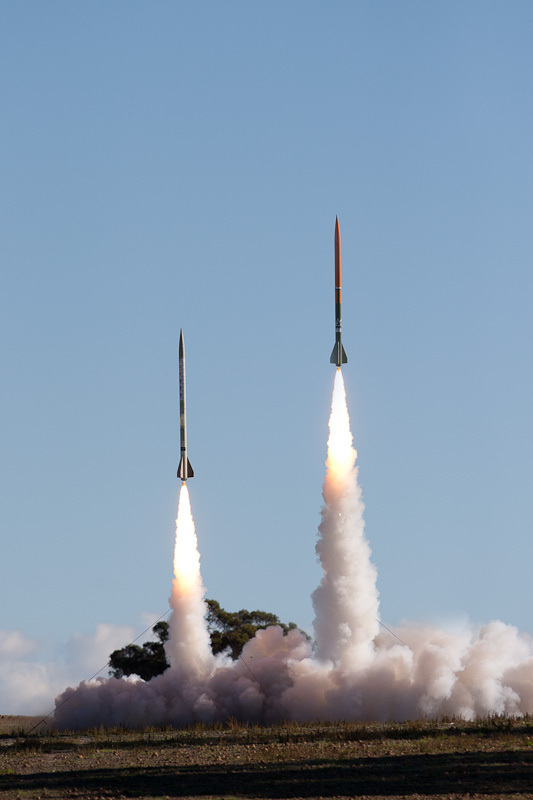 The photos of the 15th May 2011 launch were taken by Leigh Metzroth and Brendan Pratt. It was a cloudless day with quite strong winds in the early hours. It got better as they day went on. Normally we have it around the other way around as the winds pick up from around mid day onward. I was there with my family just for short time as this week will be real busy with rocket displays & talks. I appreciate guys doing the "work" and I hear Brad did the towing of the trailer, thank you mate ! Lot of testing went on with GPS and thank you goes to Ben W for the new controller which was working fine. All going well I'm looking forward to the next launch and hoping to launch few. Till next time guys and I want to thank you all for your concern ref. my health. You couldn't ask for more perfect rocket launch weather with clear skies and no wind. It was quite cool at just after 6am and I really shouldn't have hurried to get there as next person ( George) got there 40 minutes later....got lonely there before that. It was a nice relaxed launch with relaxed pace. I was still surprised that while picking up my "IO" after launch I counted 34 cars. Many visitors turned up and we had around 100 people there after all. I know that we had one person join on a day while two others told me that they will take on the hobby for sure. Many cool flights took the skies and Ashleys hybrid sounded and looked real cool. It performed a great flight. Nic's "SIDESHOW" went straight as an arrow for a great 2 flights....WWW will be next for this speedster. There were couple of mishaps and I feel for Stewart whose rocket didn't deploy at all. Another unusual event was George's modified Cheetah which did a short sky writing stunt...cause for either of these wasn't figured out on site. I'm sure they will be well researched for the cause of failure. We most likely had one of the lowest launch count for a while but it was all good and another great day of rocketry. It was a HUGE day really. We would have had around 1000-1500 people there today, easily the second biggest crowd ever. Weather was favorable most of the day with only a small shower spoiling the fun. Mostly clear skies, very light winds, humid and millions of flies. It was so good to see Leigh do a great L2 attempt, big congrats mate !!! I'm forgetting now the name of the person who did a successful L1 attempt, it was a perfect flight also. 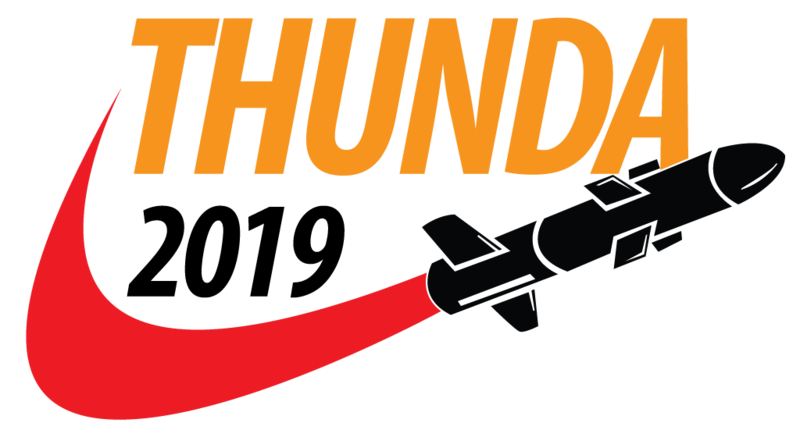 It is nice to report that Simon's Hyper and my OZ Thunder both did perfect flights and recoveries. Hey Scoop, only 4422 feet on M1297W ! There was a massive surprise for me just as I was about to launch my OZT : Petar as a LCO called me to his side and presented real nice plaque which indicated that I have been honored with the life time membership for QRS !! It was a total surprise and I really want to thank the committee and all members of QRS for this special honor !! It means a lot to me and it is very much appreciated ! Thank's to all those who helped in various ways today to make it all happen. So many names to remember so I won't name all as I could forget someone !